After camping out for the day in the Panic Room reception, it was on to our final game. We’d met a ridiculous number of their staff along the way – I’m pretty sure they had more people at the venue than there were games taking place at any given time, so there was usually someone willing to chat. It was pretty clear that they all had significant experience playing escape rooms, which bodes well: people who have been on the other side of the monitor are generally better at working out how to handle cluing and problems with the game. 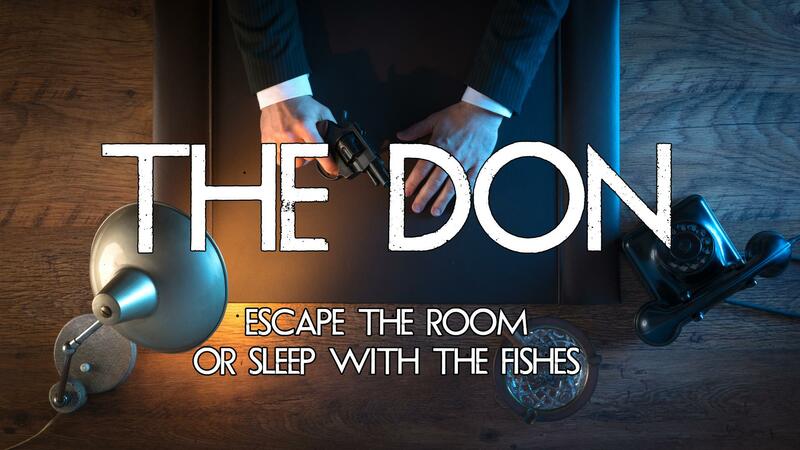 The last game of the day was the Don, a mafia experience in the basement of the building. You will be Infiltrating the den of the notorious mafia boss “Don Romano”, with a vast resume of crimes against him it is finally time to take him down once and for all! You and your team will need to break in, turn the place over and gather evidence of all of his crimes. He is an extremely paranoid man who kept everything locked up tight which is why he has evaded prison this long. Gather your team to gather your evidence and escape before he returns or you may end up sleeping with the fishes.! The Don’s an interesting room. It’s not the sort of set that jumps out at you and screams how amazing it is. At heart, it’s just another office game, but describing it in those terms underplays it. It’s a well crafted room with beautiful old furniture that seems the sort of decoration that a mafia boss would choose to underline their wealth. It’s mainly a game of locks but there are a few high-tech moments in there. The locks are a great example of where the folks behind the Panic Room go that little step further than other game designers: where your average escape room would just keep throwing in padlocks, here there are a variety of interesting and unusual locks for you to get past. The highlight is one where finding out how the lock actually works is almost a puzzle in itself. But don’t worry – it’s nothing like a Houdini lock!). The puzzles were all pretty good, covering the usual bases of observation, searching, a little bit of lateral thinking and some standard tropes. Nothing to blow you away but nothing much to get you frustrated either. Well, there was one thing that seemed to frustrate all of our teams. It was a puzzle that I came close to really liking. It was big, it was chunky and it gave you a good reason for its convoluted nature. Unfortunately, the instructions were weak, with the result that the solution was seriously ambiguous. Our team took about four or five attempts to find the right code from it, and that seemed typical. This was annoying because there were signs that they’d tried hard to avoid the confusion that often blights this sort of puzzle but then lost their way a little. The game flowed smoothly from start to finish and the finale was just right. You’re told beforehand exactly what you need to do, so you’ve got a pretty good idea throughout the game of where it will all end. The final puzzle is that right level of difficulty to ensure that you’re not hanging around too long but equally that you don’t just have a token puzzle blocking your way, and it’s absolutely clear that you’ve completed the mission. The two of us escaped in 42 minutes exactly having had around three nudges. Of the five games we played at the Panic Room that day, this felt the most conventional. Looking at it objectively, it was a good room but, for me, it lacked the innovation that abounded elsewhere at the venue. Still, a pretty good way to round off a fun time, and a game I’d recommend for beginners and enthusiasts alike. We played as a two but groups of three or four enthusiasts would be fine. If you’re beginners then I’d suggest up to five people.